Hyundai has been constantly and silently been updating the Creta. About six months after the launch of the Creta facelift, Hyundai added the SX(O) Executive variant to the Creta lineup. The variant is available with both 1.6-litre petrol and diesel engines and both can be paired with a 6-speed manual or an automatic torque convertor. Hyundai has added front ventilated seats to the Exectuive variants along with new LED tail lamps along with an ioniser in the climate control system. Hyundai is now also offering rear parking sensors, seatbelt reminder and eco-coated AC ducts as standard on the Creta. Hyundai Creta prices start at Rs. 9.60 lakh for petrol and goes upto Rs. 14.16 lakh. The prices of Creta diesel variants start at Rs. 10.00 lakh and the top-end diesel is priced at Rs. 15.65 lakh. Hyundai Creta is available in 15 variants and 9 colours. The claimed ARAI mileage for the Hyundai Creta petrol is 15 kmpl, and for the Hyundai Creta diesel is 22 kmpl. Q. Which car is better Creta or XUV300? All of them get the basics, including beefed up ground clearance, a dollop of swag and a dash of tech, right. Which one scores extra credits? The cool kid in the Hyundai family gets a makeover. More of the same or a whole new dimension? We’ve just compared the Hyundai Creta to two of its biggest rivals - the Maruti Suzuki S-Cross and the Renault Captur. Which one’s the right choice for you? You can find out by heading over to our detailed comparison review. In case you’re looking for a detailed review of the updated Creta, you can find that here. The Creta also had the distinction of being Hyundai’s 8 Millionth car in India. The South Korean brand achieved the feat in a little under 20 years. With the facelift, the Creta’s design hasn’t changed dramatically. It still looks like the lovable mid-size SUV it always was, but with a few nip and tucks. The biggest update is on the face, where the wider cascade grille takes centre stage. Naturally, the bumper has been altered to accommodate the newer grille, and with its flowy character lines, it looks a touch more aggressive than before. Also new are the headlamps. The shape remains the same, but Hyundai has tweaked the detailing, and moved the daytime running lamp from the base of the headlamp to around the fog lamp. Save for the face, there are no major changes. Hyundai has given the Creta a new set of 17-inch alloy wheels, a new rear bumper (with a prominent faux skid plate) and reworked tail lamps. The facelift does add a dose of freshness (especially in the new orange and blue hues), but we were expecting some more wow by way of LED lighting. The biggest change to the cabin of the Creta sits right above your head! Oh yes! In the top-spec manual and automatic versions, you get an electric sunroof. Other updates include a new MID (multi information display), a powered driver seat and wireless charging. Hyundai is also offering a wearable key they like to call the H-Band that also doubles up as a fitness tracker. In terms of space, it’s no different compared to the outgoing version. The cabin is still quite narrow, especially at the rear, which makes it a four-seater in our books. We’ve got no major complaints from the cabin otherwise - it’s built well and ergonomically sound as well. Goodies you expect in this price range including automatic climate control, a touchscreen infotainment system, cruise control ad rear air-conditioning is bundled in. However, a few features such as auto headlamps and wipers are strangely missing from the Creta. In terms of safety, the top-spec Creta gets six airbags, ABS with EBD, Hill Assist and electronic stability program. Strangely, ISOFIX child seat mounts are offered only in the top-spec automatic model. All other variants get dual airbags and ABS as part of the safety kit. Hyundai Creta is available in 6 petrol and 7 diesel variants. The claimed mileage for the Creta Petrol is 15.8 kmpl and for Creta Diesel is 22.1 kmpl. 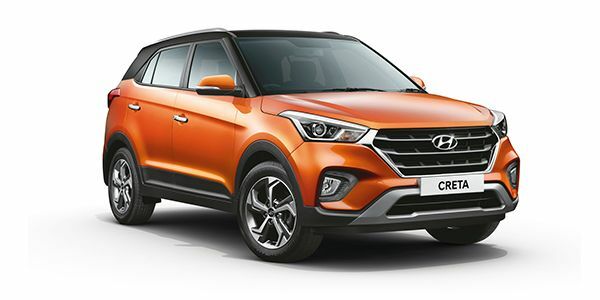 In technical specification, Hyundai Creta 1.6 E (Base Petrol) is powered by 1591 cc engine delivering 121.3 PS power and 151 Nm torque whereas Creta 1.4 E Plus (Base Diesel) is powered by 1396 cc engine delivering 88.7 PS power and 220 Nm torque. Dimensionally, Creta stacks under 4.27-metre of length and features 400-liter of boot space. It also comes with 10 manual and 3 automatic transmission variants at a staring price of Rs. 9.44 lakh and Rs. 13.20 lakh respectively. If you want a Creta, you get to pick between five variants - E, E+, S, SX and SX (O). While the petrol engine is available across variants, you get the 1.4 diesel only in the E+ (there’s no E) and S variants. The 1.6 diesel is available with a manual transmission in the SX and SX (O) variant, and with an automatic transmission in the S and SX variant. Notably, the top-spec automatics borrow some features such as the sunroof and 17-inch alloy wheels from the top-spec manuals. If you’re slightly confused, we don’t blame you. If you’re on a budget, pick the S variant, and if you aren’t the SX variant should meet all your needs. Of course, no one’s stopping you from splurging and going all out. Renault Duster: The car that started it all, the Renault Duster is the only modern crossover in the segment to feature an AWD system. Its butch design, adequate space, CVT transmission (petrol), AMT (diesel) and all-weather ability make it score a lot of brownie points in the segment. Interior quality and limited service network make it less appealing. Nissan Terrano: The Duster's better-looking cousin (for some), the Terrano suffers from being too overpriced for its own good. It does get a diesel AMT variant, which is a good option for those looking for a convenient urban SUV. Maruti S-Cross: Heavily underrated for what it can do. Yes, it doesn’t have that lunatic 1.6-litre diesel engine anymore, but you can’t fault it for space, ride or features. What more do you want? Will features like ventilated seats, LED taillamps and standard rear parking sensors be enough to keep the competition at bay? A BEST CAR IN SUV PATTERN AND A GOOD RIDING EXPERIANCE.I RECCOMEND THIS CAR FOR SUV LOVVERS. I love it. Only issue in the product is softer suspension.